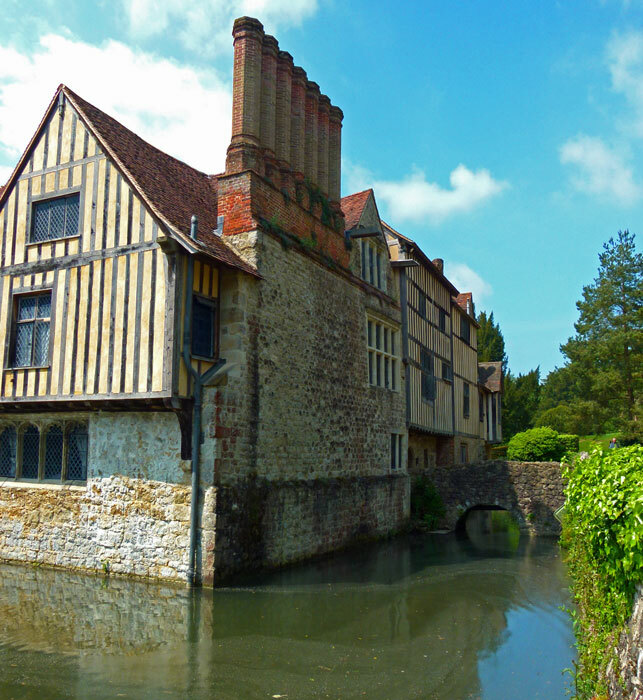 Tucked neatly away in the Weald of Kent is a little dream medieval moated manor house called Ightham Mote. It is closer to the hamlet of Ivy Hatch than to the village of Ightham. Before we go any further, let’s make it clear that Ightham is pronounced ‘item’. Of course it is. It is derived from a Saxon (or Jutish) name, Ehta, plus the common suffix ham, so it means Ehta’s homestead – or, as we would say, ‘Ehta’s place’. The ‘mote’ is possibly because it might have been built on a moot – an ancient meeting place; or possibly because the house is surrounded by, yes, a moat. Go there on a hot spring or summer’s day, when the sun heats the air and the ground radiates that so-comforting smell of warmed earth and vegetation. Wander round the gardens, the orchard, the woods – then go into the cool of the house, allegedly historian David Starkey’s favourite Tudor property. It actually originates from the early 14th century and was developed over the next hundred years or two to form a complete square enclosing a cobbled courtyard. Restored in the late 19th century and extensively repaired in the 1950s, by the 1990s the ravages of time, acid rain and deathwatch beetle had taken their toll; the house was saved from oblivion by a £10m+ restoration project undertaken by the National Trust between 1989 and 2002. 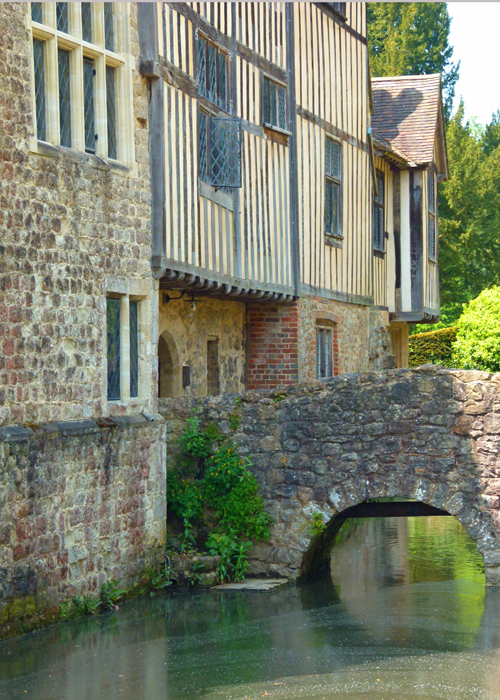 It is only six miles from the bustling market and commuter town of Sevenoaks, but, even so, Ightham Mote feels a little cut-off, nestling in a cosy valley. When it was built – and no one knows who was responsible for that, or exactly when it happened – the place must have seemed miles from anywhere, perhaps a clearing hacked out of what was then almost impenetrable forest, the Weald – another old English/Germanic word meaning ‘forest’ – Wald in modern German. 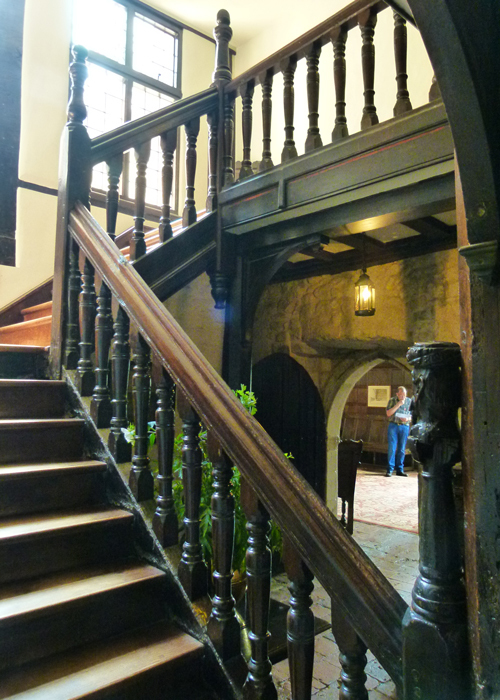 Ightham Mote is not one of those witnesses, so far as we know, to the great events of history. It was home to a succession of well-heeled, but not always fabulously wealthy, gentry, who evidently kept their heads safely below the parapet. It seems the earliest owner might have been one Isolde Inge, a shadowy figure, who lived c1330-1360, widow of a William Inge, and who possibly later married into the St Cler, or Sinclair, family. Isolde is thought to have built the oldest part of the house, including the great hall, old chapel and crypt. The next owner, in around 1360, appears to have been a Sir Thomas Cawne. Thomas, son of a Staffordshire tailor, became a soldier, fought in France, was knighted and settled down in Ightham with his bride, Lora Moraunt of nearby Chevening. It was possibly Cawne who put a moat round the house to keep out the bad guys and wild animals – though it was not designed to withstand a serious assault. 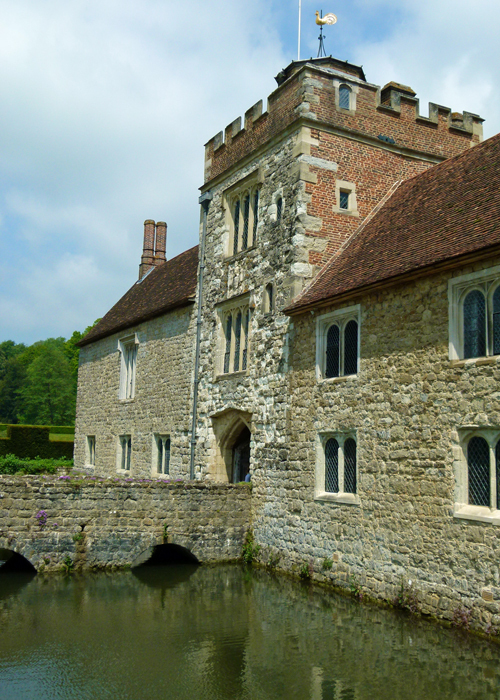 In 1399, Ightham Mote came into the affluent Haut (or Haute) family by marriage and stayed there until 1519. 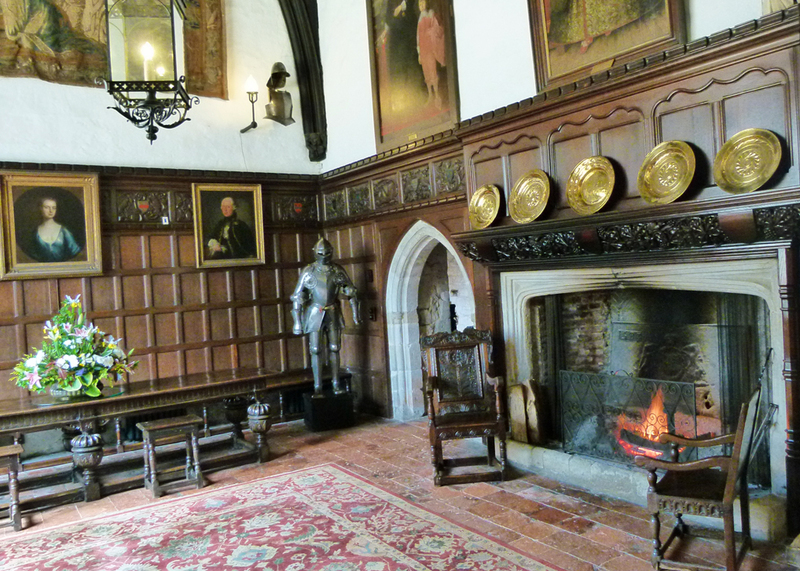 Sir Richard Haut, a cousin of Elizabeth Woodville who became Queen Consort of England when she married Edward IV in 1464, inherited Ightham Mote in 1462. Haut carried out considerable improvements, adding wings which made the house U-shaped and building further accommodation in the grounds – which is still there. In 1521, Ightham was purchased for £400 by an ambitious courtier of Henry VIII’s, Sir Richard Clement – and because of him the place is rich in Tudor features and images. 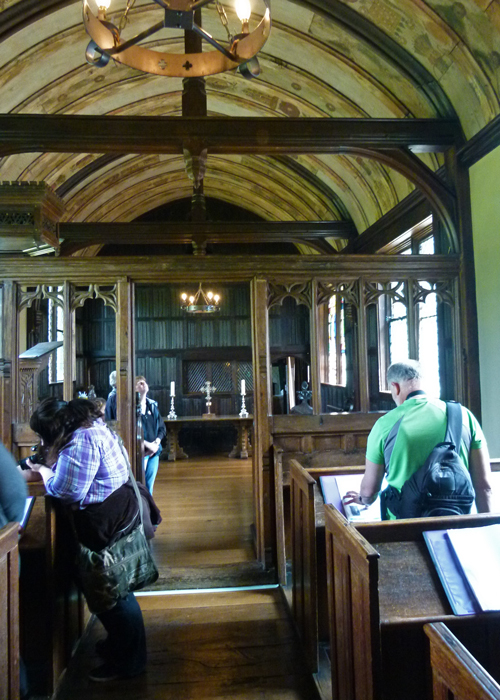 It was Clement who added an astonishing Tudor chapel, with a wooden barrel roof, painted with Tudor roses and symbols representing Catherine of Aragon, Henry VIII’s first wife. You do wonder whether he was hoping for a royal visit; maybe he even had one – who knows? From 1591–1889, Ightham Mote was owned by the Selby family. Dorothy Selby was one of Elizabeth I’s ladies in waiting and was renowned for her needlework. Her husband, Sir William, was a soldier who, as Gentleman Porter of Berwick-upon-Tweed, was one of the first officials to welcome James Stuart to England as its new king in 1603. There are stories, almost certainly untrue, that Dorothy Selby was in some way connected with the mysterious Monteagle Letter, sent by person or persons unknown to warn William Parker, Lord Monteagle, that Parliament would receive a ‘terrible blow’ and to stay away from it, resulting in the uncovering of the notorious Gunpowder Plot in 1605. Leaping forward in time, the Selbys seem to have gradually run out of money and, in 1887, rented Ightham Mote to William Jackson Palmer, an American engineer who, among many other achievements, founded the town of Colorado Springs. Eventually, a young man, Thomas Colyer-Fergusson, bought Ightham Mote for £38,000 from the Selbys. Tragically, his wife died in 1902, but he raised his 6 children and continued to live there until his death in 1951. Colyer-Fergusson lost a son in each world war and his only surviving heir, his grandson, could not take on responsibility for such an expensive property. So it was sold to a consortium of local businessmen who hoped to rescue it, but for some reason gave up. Which brings us to the last private owner of Ightham Mote and one of my favourite stories about the place – Ightham’s white knight Sometime just after the First World War, a young American, Charles Henry Robinson of Portland, Maine, was on a cycling tour of Kent when he stumbled (should that be ‘wheeled’?) upon Ightham Mote and fell in love with the place. He never forgot it and, years later in 1953, by this time a successful businessman, he was idly leafing through Country Life when he noticed his dream property up for sale. The version of the story I like is that he dropped everything, dashed across the Pond and made an offer, but got cold feet when he was sailing home on the Queen Mary, wrote to withdraw his offer, then couldn’t post the letter because the ship’s post office was closed. And so Robinson found himself with a medieval moated manor house, plus about 500 acres, in the Garden of England. Amazingly, he always intended to give Ightham Mote to the National Trust – he wrote it into his will in 1953. His ashes are buried there – he died in 1985 – and in the crypt is a memorial to him inscribed ‘A Pilgrim Returned’. Charles Henry Robinson was descended from the Pilgrim Fathers. One of the best rooms in my humble opinion, (alas, my photos were awful) is his library. Maybe it was my imagination, but somehow I felt it had a New England feel to it; elegant, clean, calm and uncluttered, with pale blue painted bookshelves. There are various dodgy tales of ghosts and what-not associated with Ightham Mote, including one of a seated female skeleton found behind a bricked-up door during renovations in 1872. Another unreliable anecdote to end on concerns Cromwell’s soldiers – often getting history’s bad press. A troop was on its way to rob the rich Royalist Selby family, but became lost in the dense forests that covered this part of England in those days. Unable to do over Ightham, they apparently pillaged somewhere else instead. The story doesn’t say which other innocent residence was on the receiving end of their obnoxious visit, so I suspect it might be a bit of Cavalier propaganda. 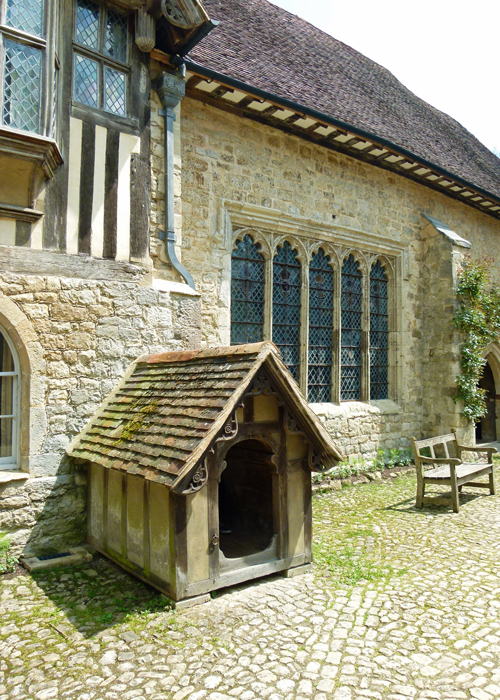 Finally, Ightham Mote boasts Britain’s only Grade I listed dog kennel, built for a Victorian St Bernard called Dido. You couldn’t make it up, could you? It certainly is – thanks for dropping in! A grade 1 listed dog kennel!?!? It’s gone on my list! It is a long time since I visited I really should find the time to go back some day. 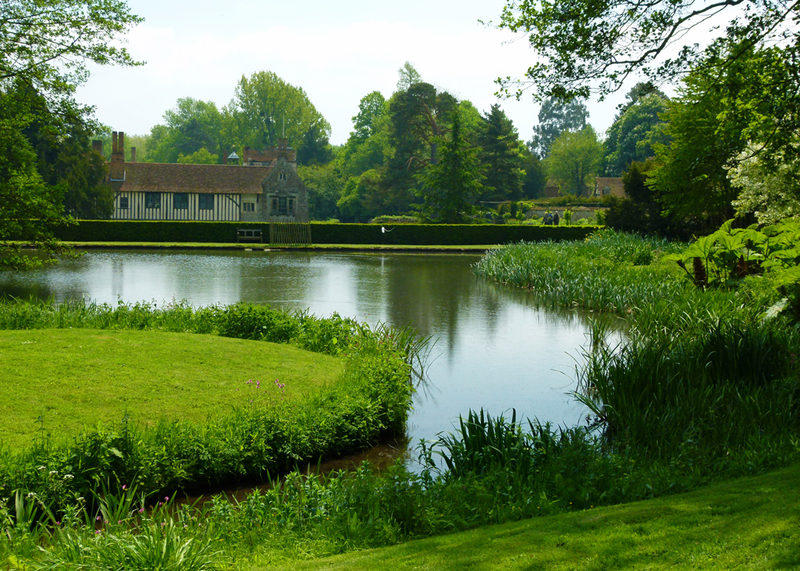 As a girl I often went to Ightham Mote and I remember lovely walks about the place. My father would never go inside any places we visited as he wasn’t interested so I haven’t seen anything beyond the outside walls. The last time I was there was June 1981 just before my brother’s wedding! Thank-you for the wonderful tour, Mike! One day I will return to Kent and visit all the places we walked round with the dog! Kent has been on my bucket list and now I can add some fascinating places to be sure and visit. I have a friend I never met in person in Kent and one day, after 10 years of writing to one another, we will meet up in her town in Kent. That’s brilliant, Tina. I’m sure s/he has loads of ideas about places to visit, but let me know if you need any suggestions. I loved this place. You’ve reminded me just how long ago our visit was because the restoration was still in progress. Visitors could peep through an open doorway to watch the craftsmen at work. Reckon it must be my favourite Tudor property too. And I remember the dog kennel! What a beautiful place! Well worth preserving. So charming. Would love to visit, but where is it? Kent? How will I ever remember all these places you highlight so that I can visit them one day? Was it one of the Antique Roadshows that came from there recently? I could not wait to say about the Grade I listed kennel !!! Dunno, Lesley – Antiques Roadshow certainly visits some lovely spots. I have always wanted to visit this one, hopefully some day.